Are you in for snow running this winter? Or perhaps you want to partake in a race competition? Well, next to improving your stamina, you will need good running snowshoes for that. Wearing the right snowshoes can really make the difference. Not only will it make you more agile and stable along the snow-covered trails, but it can also keep you off from any discomfort. We’ve listed three of the best snowshoes for running in this post. You’re going to find out why we love them and what makes them the top running snowshoes, as opposed to other models. 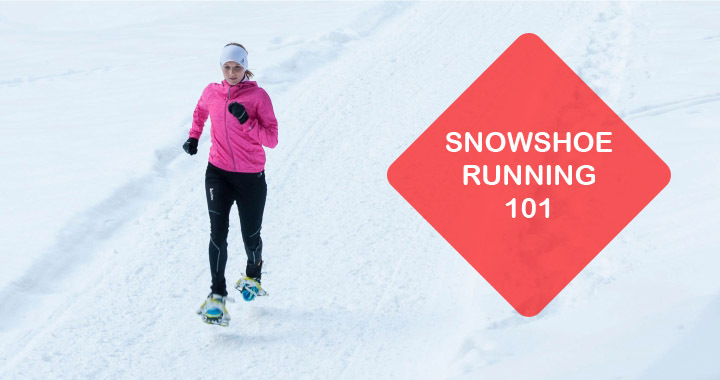 Also, you can learn about anything you need to know before you start running in snowshoes through our beginner’s guide. 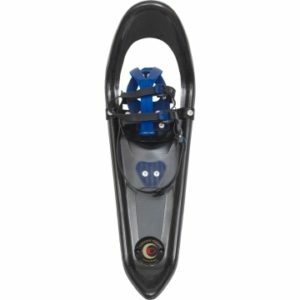 Crescent Moon had one thing in mind when they design their Composite Kilo Run snowshoes: to help snowshoe runners through their laps with the shortest time. Coming in only one size option (24-inch), these snowshoes are quite big for running snowshoes, actually. However, they make up for such oversized footprint by using ultra-light material. Instead of the usual Nytex, these snowshoes are made entirely of carbon fiber composite, offering durable and lightweight construction all at once. Each pair of the snowshoes weigh in only at 2-pound. You shouldn’t notice any difference in weight while running with them. Besides, the larger footprint can also help with the flotation on fresh powder. Also known as The Rocket, Crescent Moon Composite Kilo Run sports a comfortable and simple single-loop binding system. It fits running shoes from size 5-15, which is great if you’re a big guy. Should you want it, you can even remove the bindings to cut off more weight from the gears. They come with all the necessary kits that allow you to mount your footwear directly to the snowshoes. Similar to Crescent Moon Gold 9, these snowshoes feature three different crampons below the decking. They’re placed under your toes, balls, and heels respectively. They’ll help grip the snowy trails as you run. 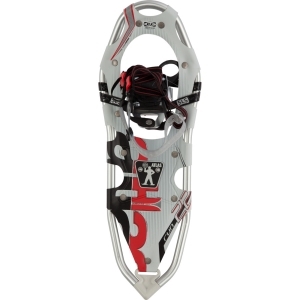 Atlas Run Snowshoes are perfect for those looking to figure things out in snowshoe running. They’re relatively inexpensive compared to other running snowshoes used by professional. 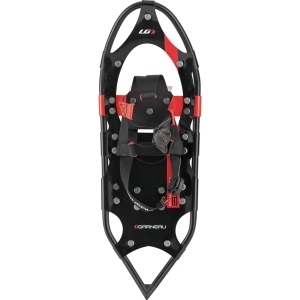 Still, they come with lots of nice features that’ll make your first run in snowshoes exciting. The small footprint (8 x 22-inch) will allow you to be more nimble on the snow. The tails are V-Shaped and tapered too, boosting the overall maneuverability. You’re going to appreciate it more as you run on one of those narrow hard pack singletrack. The decking is constructed of Nytex. You may not like the noise it makes as it strikes down against hard packed snow, but they’re sturdy enough to last numerous running sessions. Unlike Crescent Moon Kilo Run, Atlas Run Snowshoes are more on the conventional side. Their frames are still made of separate aluminum alloy, instead of having it molded together with the decks. The bindings are not detachable but we kind of expect it considering the low price tag. Still, it’s a relief to know that they can be taken on and off quickly. The spring loaded suspensions that connect the bindings with the decking are very helpful too. They keep the snowshoes close to your feet, preventing them from dragging you down on the snow. Louis Garneau Course 721 are among the favorite snowshoes for professional runners. They are the smallest snowshoes in this list, measuring in at 7 x 21-inch. That’s the minimum length of snowshoes qualified for National Races. With such small size, they easily excel in weight department too. Just so you know, Louis Garneau Course 721 are the only running snowshoes with bindings that come in under 2-pounds each pair. Unfortunately, their design doesn’t allow users to take off the bindings and use direct mounting kits instead. That aside, you’re still going to love their bindings. Instead of using the common straps-in feature, they sport a fancy dual Boa cinch system. It’s not only very comfortable and secure but also can be set very quickly. The frame design of Louis Garneau Course 721 is extremely tapered at the tails, making it very easy to move on groomed trails and hard pack. However, it’s like having a two-edged sword. As a result of having very small footprint and greatly tapered tails, these snowshoes perform poorly in powdery situations. You’ll have a hard time keeping your feet on the surface if you run into fresh powder. They’re indeed a top performer on trails but some racing tracks have a good portion of fluffy light snow and that’s where they fall short. It’s yours to decide. When you’re looking for running snowshoes, you need to keep in mind three important features: size, weight, and bindings. Good snowshoes for running need to be small so you don’t have to make drastic adjustment on your running form. The recommended size ranges from 20 to 25 inches long. Any bigger than that, you’re going to feel really awkward and difficult to maintain your speed. That being said, you should know that even the most compact running snowshoes will require you to widen your gaits and lift your knees higher. Ideal running snowshoes must also be lightweight so you can preserve your energy better and run faster without wearing your leg muscle out too fast. That’s why the majority of snowshoes designed for running and racing have minimalist traction systems, a particular feature that largely accounts for its weight. Last but not least, they have to come with bindings that are easy to set, comfortable, and most importantly secured. You will not want to find out that your snowshoe bindings start to loosen out and need readjusting when you’re running. You don’t need to concern yourself too much about flotation, aggressive crampons, or rugged construction. After all, the snowshoe trails you’re going to compete in are mostly groomed, or in some cases, broken. Sure you may run into fresh powder and unconsolidated corn but you won’t run on some steep slopes off the beaten track with fluffy waist-deep powder and slick wet snow along the way. And the three snowshoes we’ve listed above suit just all the criteria for best running snowshoes. The coolest thing about snowshoeing, whether it’s running or hiking, is that it has zero learning curve. If you can walk, then you can snowshoe. That’s the general rule. Even so, there are a number of things that you should pay attention to before you kick it off. Start Slow. For snowshoe running in particular, you should always start at slow pace especially if you’re a novice. 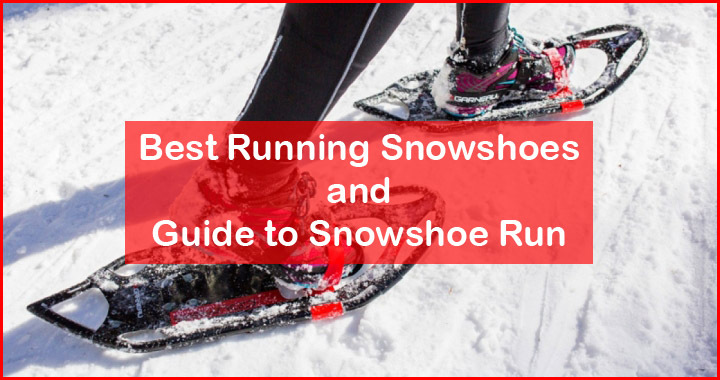 Although the key principles remain similar, snowshoe running is tougher than road running and trail running. The snow conditions may vary along the trails, requiring you to adjust your running form from time to time. Not to say that the snowshoes themselves also add more weight to your feet. So, instead of starting out at your normal pace, it’s better if you just keep it steady and focus on finding your rhythm at the beginning. Group Run. You can always train and run alone by yourself but it’ll be much more fun and exciting if you have companies. Besides, there’s always a chance to learn something new too if you’re in a group. Participating in an organized event like Winter Trails Day is a good way to find people to run with. Following a short coaching clinic from a pro can also get you some friends on your first run. To Race or To Not Race? Don’t get the wrong idea that snowshoe running must always be competitive and that you have to race. You can always run just for fun. Still, if you’re in for a competition, there are a bunch of races you can partake in. Check out usssa.com and snowshoeracing.com, and in the northeast, Runwmac.com to find a race. These races are held throughout the winter and the frequently featured distances are 5K to 10K. Let’s start from the bottom. First off, you will need wool socks. Make sure you get an extra pair because there’s always a chance that snow will get into your shoes and you’ll end up with wet socks. As for the footwear, any running shoes would be perfectly fine. They don’t have to be fancy and expensive. However, if you’re looking to get more comfortable, consider trail running shoes. Their design and material can help reduce moisture buildup. Additionally, wear gaiters too. They’re a great extra protection, keeping the snow out of your shoes. Again, these don’t have to be fancy, the short ones will do. On to the apparels. Obviously, you’re going to sweat. So wear some base layers to absorb it. Since your snowshoe may occasionally fling snow at your back, wear a light shell jacket that sheds snow. You may want it to have a wind protection too because winter can be quite breezy. Also, avoid wearing jacket made of fleece because the snow can wet it. The same rule goes with pants. Recommended accessories include hat, sunglasses, and of course gloves. Bring some extra pair for the latter. Believe me, you’re going to be very thankful to have spare dry gloves. There’s always a chance to get tripped, fall down, and make those gloves of yours wet in your first run. Last but not least, put on some lip balm so you won’t end up with chapped lips at the end of your training. This is another cool thing about snowshoe running. You don’t have to go to ski resorts to start snowshoeing. As long as there’s snow (3 to 5-inch), you should be able to kick it off. Local golf course and park near your house should make a do. Still, if you have problem finding a good place to run, go check out snowshoes.com. The website has over 3,000 trails, submitted by fellow snowshoers across the state through Google Map. Upon choosing the trail, make sure it’s groomed and dominated by hard pack. This can be very helpful for novices to get used to the snowshoes. The areas around Rockies and Sierras have many of such trails but you should be able to find a similar one on any snow parks, cross-country centers, and also forest-service areas. Avoid trails that have a long narrow singletrack as well as fresh deep powder because they can be very tricky for beginners. Now once you get the hang of all the whole things about snowshoe running, you might be tempted to take part in a race. If that’s the case, you have to improve your technique and also your speed. At this stage, you can start going through trickier trails where the path is sometimes broken and may have large part of knee-deep snow. Check out the following tips to better and faster snowshoeing. Always take one or two warm-up laps and stretching before start an intense training. I know it’s obvious but when you run in snowshoes, you’re at more risk at getting injuries especially on your ankles. So, never compromise on this one. Run uphills. This is a great practice to improve your strength and speed. There are generally two ways to do this and you should rely on both. First, running with your toes and balls doing the landing while keeping your heel raised. This is the safest method but it requires more energy. Second, running with your entire foot striking down the slopes. This one is easier but your arch will be at bigger pressure. Run downhills. As you run uphill, you can’t help but have your pace down and lose your time. What is the best way to make it up other than getting it all out on a downhill run? Have a lot of practice for downhill running and try to trust your feet. You will eventually be more confident and comfortable with such forward momentum. And at the end of the day, you’ll learn that you can run faster. Run through narrow singletrack and fresh snow. In a race, you can’t expect the trail to be conveniently groomed all the way to the finish line. You have to be ready for that tricky narrow singletrack as well as fresh powder. Scout the trail prior to running. Learning about the trail you’re going to race in can help you make decisions regarding when to increase the speed, where you should be particularly careful, etc. The more you’re prepared for the challenges, the faster you run. Bring an insulated Camelbak when you’re training but leave it at home when you’re racing. The extra weight on your back will slow you down. Also, since water stops are not common in marathon snowshoe run, consider to start hydrating two days prior to the race. Fill yourself in. Always have a Gu before you start running. Ideally, 30 minutes prior to the racing. For beginners, it’s never a bad idea to bring an extra gel in your pocket, especially if you compete in 10K run. So, how about that? Quite a handful, huh? Anyway, if you’re serious into snowshoe running, we suggest that you join the USSSA. The community will help you a lot to improve in this exciting winter sport and you get to subscribe to Trail Runner magazine too. You can register yourself here. The registration fee is only $30.